Is the buildup in border protection effective? The United States has poured unprecedented resources into securing its borders, spending billions of dollars on surveillance technology, fencing and personnel. Today more than 21,000 federal agents guard the borders, nearly 10 times the total in 1980. The buildup, particularly strong along the 1,933-mile-long Mexican border, also includes new measures at so-called ports of entry — authorized border-crossing points, seaports and airports. 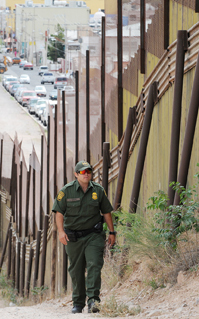 Concerns about illegal immigration initially spurred the buildup, but it accelerated after the 9/11 terrorist attacks. Immigration reform legislation under consideration by Congress includes additional measures, including doubling the Border Patrol and allocating billions more for fencing and surveillance. But critics question the additional spending, saying existing border-security measures have not deterred illegal immigration or made the nation safer from terrorism. Supporters, however, point to a reduction in illegal crossings as proof the buildup is working.